Reliable and reproducible analytical methods are essential to both the pharmaceutical development process and the evaluation of a drug to ensure that the end-product delivers the intended benefit to the user while maintaining compliance with regulatory standards for potency, purity, and stability. Our formulation development and clinical manufacturing efforts are fully supported with our in-house laboratory that offers a full range of advanced technologies in support of drug development and evaluation efforts that lead up to NDA and ANDA submissions. 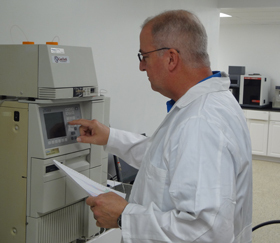 At Sterling, our chemists take pride refining existing or developing new and innovative analytical methods that minimize non-uniformity and enhance production yields. It is through our experienced and dedicated team that enables us to seamlessly integrate an optimized contract manufacturing program into each client’s unique needs.